FaceTite™ To Reduce The Signs Of Facial Aging! The face is often one of the first areas to show signs of aging in the form of sagging skin, folds, or fine lines. As a result, many patients would like to firm loose skin and achieve a younger-looking facial profile. Advances in technology have resulted in state-of-the-art facial rejuvenation solutions that can yield long-lasting results with minimal downtime. FaceTite™ can reduce the signs of facial aging without the need for invasive surgery! FaceTite™ uses radio frequency energy to tighten skin and encourage collagen production for a firmer-looking appearance. Learn more about FaceTite™ treatment below. FaceTite™ can target the upper, mid, and lower facial regions. Patients can utilize FaceTite™ radio frequency skin tightening to lift drooping or sagging skin around the brows, midface, chin, and neck. During FaceTite™ treatment, a small electrode is placed on your skin while a specialized cannula is inserted beneath your skin through a tiny incision. The electrode and cannula work together to deliver radio frequency energy to the lower layers of your skin. Heat from the FaceTite™ device encourages the production of new collagen fibers under the skin, leading to improvements in skin structure and elasticity. If necessary, small amounts of unwanted fat can be removed to further accentuate facial contours. FaceTite™ transmits bipolar radio frequency energy, resulting in more precision and control during treatment. What Can I Expect After FaceTite™ Treatment? FaceTite™ patients can expect slight bruising or swelling to last a few days following FaceTite™ treatment. Since FaceTite™ is minimally invasive, patients experience less downtime than traditional facial surgery. You should be able to resume your daily routine after a few days. NYC plastic surgeon, Dr. Elie Levine, NYC dermatologist, Dr. Jody Levine, and the staff at Plastic Surgery and Dermatology of NYC welcome any questions you may have about FaceTite™, as well as our other facial rejuvenation treatments. Contact our office at 212.988.1800, or request an appointment online today for your personal consultation! Liposuction Treatment Areas For Men – Achieve A Firmer Physique! Are you looking to achieve a firmer, more-masculine physique this summer? Despite your best efforts, stubborn fat may be getting in the way of hard-earned results. Certain problem areas are extremely difficult to slim, no matter how much time you spend at the gym. Excess fat under the chin, as well as fat pockets around the midsection or back, can take away from youthful definition. At Plastic Surgery and Dermatology of NYC, we understand that certain problem areas may be preventing you from achieving an athletic-looking body. We offer a variety of liposuction treatments to trim fat and enhance body contours. A defined jawline is among the most-coveted physical attributes, as a strong chin can enhance the entire facial profile. Submental liposuction targets excess fat underneath the chin to accentuate your jawline. These fat pockets often lead to the appearance of a double chin, which can result in a rounder-looking facial profile. Small cannulas are inserted under the skin to gently suction-out fat cells from the neck area. Additionally, technology-based liposuction techniques, including SmartLipo® and VASER® LipoSelection, can promote skin tightening by heating collagen fibers beneath the surface. These lipo procedures can achieve a more-defined chin line for patients. Additionally, submental liposuction can be combined with facial rejuvenation procedures, including a facelift or necklift, for a younger-looking appearance. For men suffering from gynecomastia, or enlarged male breasts, lipo procedures can be used to help sculpt a firmer chest. Gynecomastia may result from obesity or genetics and is difficult to reduce through diet and exercise alone. During male breast reduction, excess fat can be removed with liposuction to improve chest definition. Traditional liposuction options, including tumescent lipo, super wet liposuction, and power assisted lipo, as well as technology-driven liposuction, can be used during this procedure. Gynecomastia surgery can also be combined to remove or re-drape excess chest tissue, reducing the size of male breasts. Together, these body sculpting techniques can promote an athletic-looking chest. Back liposuction can remove stubborn fat from the upper, mid, and lower parts of your back to enhance contours. Liposuction can also eliminate mid-back bulges and lower back pockets. Depending on your individual treatment, either traditional liposuction or technology-based lipo may be utilized. Your plastic surgeon may also recommend back lift surgery to tighten lax back skin and promote sleek shoulders and back muscles. The abdomen and flanks are among the most-troublesome areas for patients, as buildups of localized fat deposits often result in love handles at the waist. Abdominal liposuction is designed to remove stubborn belly fat and bulging. Eliminating excess fat from the abdominals and oblique muscles can promote a flatter-looking stomach. Additionally, a tummy tuck can surgically tighten abdominal muscles that have become weakened or stretched due to weight gain or substantial weight loss. NYC plastic surgeon, Dr. Elie Levine, NYC dermatologist, Dr. Jody Levine, and the staff at Plastic Surgery and Dermatology of NYC welcome any questions you may have about submental liposuction, male breast reduction, back lipo, and abdominal liposuction, as well as our other body contouring procedures. Contact our office at 212.988.1800, or request an appointment online today for your personal consultation! Facial Rejuvenation Solutions to Reinvigorate, Restore, & Revitalize Your Look! Looking to restore a youthful glow to your facial profile? As we get older, our age inevitably starts to catch up to our appearance in one form or another. Facial tissues begin to sag, leaving creases and folds that contribute to a worn look. At Plastic Surgery and Dermatology of NYC, Dr. Elie Levine specializes in facial rejuvenation procedures to improve facial contours and definition for natural-looking results. Below are just a few of our facial surgery solutions that can be combined to achieve a more youthful you! Eyelid surgery can lift the eyelids back to a natural position in order to improve the appearance of your gaze. Also known as blepharoplasty, this facial rejuvenation technique removes excess or sagging skin around the eyes to restore youthful contours to the upper lids. Patients who suffer from under-eye bags, puffiness, or hooding around the eyelids can opt for blepharoplasty to reduce the appearance of these troublesome issues. Combining a facelift with a blepharoplasty will enhance your results and create facial harmony. Facelift surgery targets loose and sagging skin around all areas of the face. A facelift can smooth wrinkles and deep creases by elevating soft tissue and tightening lax skin. Jowls can also be corrected through facelift surgery. Undergoing a facelift and fat transfer can restore volume and improve facial definition for long-term results. Many patients consider the chin a cosmetic concern. A receding jaw line can result in a rounded facial profile. Chin implant surgery can add definition to the chin for a prominent-looking jaw line that inspires confidence. Chin implants can be shaped and sized according to your specific goals and desires, allowing for chin augmentation results that enhance your individual facial profile. Placing a chin implant in combination with a neck lift will produce a more balanced and complete youthful appearance. If your neck is affected by aging in the form of drooping skin and neck bands, a neck lift may be a viable option for you. 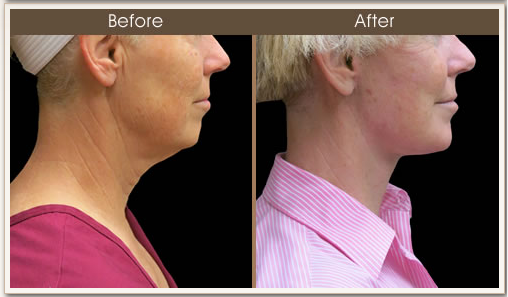 Neck lift surgery can tighten lax and sagging neck skin to create a defined neck line. Undergoing a neck lift can complement blepharoplasty, facelift and chin augmentation results, while cosmetic fillers can add temporary volume to areas of the neck without undergoing surgery. NYC plastic surgeon, Dr. Elie Levine, NYC dermatologist, Dr. Jody Levine, and the staff at Plastic Surgery and Dermatology of NYC welcome any questions you may have about eyelid surgery, facelift, chin augmentation, and neck lift, as well as our other facial rejuvenation procedures. Contact our office at 212.988.1800, or request an appointment online today for your personal consultation! Facelift and Neck Lift Procedures For a More Youthful Appearance! As the warm weather approaches, you’ll be leaving behind sweaters, scarves and other cold weather clothes in favor of your favorite spring wear! However, as the layers disappear, you may find that you are self-conscious of what’s underneath—specifically sagging skin in the neck area. Also known as “turkey neck,” this condition is characterized by excess neck skin that sags to the middle of the neck area, leaving you feeling uncomfortable with your appearance. At Plastic Surgery and Dermatology of NYC, we can combine our neck lift and facelift procedures to smooth neck lines and restore your skin to a more youthful appearance! We consider the neck to be part of your overall facial profile. Excess skin in the neck area can take away from the youthfulness in your face, and vice versa. To combat loose skin and excess fatty deposits on your neckline, consider one of our neck lift procedures. We offer liposuction for a simple slimming and shaping of the neck, as well as more advanced procedures for excess skin and soft tissues. Our neck lift procedure can tighten skin to create not only a sharper neck line, but also to improve the definition of your jaw to enhance your expression! In addition, our New York Plastic Surgeon, Dr. Elie Levine, offers the revolutionary LazerLift procedure to remove sagging skin without scalpels, stitches, or scars! LazerLift uses precise laser technology to tighten skin and promote structural lifting in as little as half an hour. Even after undergoing LazerLift or a neck lift procedure, however, sagging in the cheeks or excessive facial wrinkles can negate those great results! To combat this possibility, patients often combine their neck lift procedure with a facelift in order to balance out their expression. A facelift can correct these issues and elevate the face’s soft tissue to achieve a more natural and youthful look. By combining our facelift procedures with a neck lift, you can improve your entire profile at once! Our NYC dermatologist, Dr. Jody Levine, NY Plastic Surgeon, Dr. Elie Levine, and staff at Plastic Surgery and Dermatology of NYC welcome any questions you may have about our neck lift or facelift procedures. Contact our office at 212.988.1800, or request an appointment online today for your personal consultation!